This was very tasty and definitely a keeper. Preheat your oven to 350°F. Generously grease a 10-cup Bundt pan, either with butter or a nonstick spray. * Set aside. In a medium bowl, whisk or sift 2 1/2 cups flour (leaving 2 tablespoons back), baking powder and salt together and set aside. In the bowl of a stand mixer or large mixing bowl, cream together the butter, sugar and lemon zest until light and impossibly fluffy, about 3 to 5 minutes. 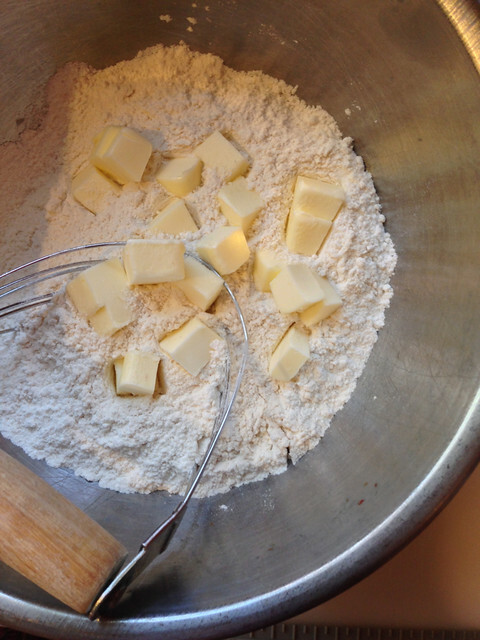 Then, with the mixer on a low speed, add your eggs one at a time, scraping down the bowl between each addition. Beat in vanilla, briefly. 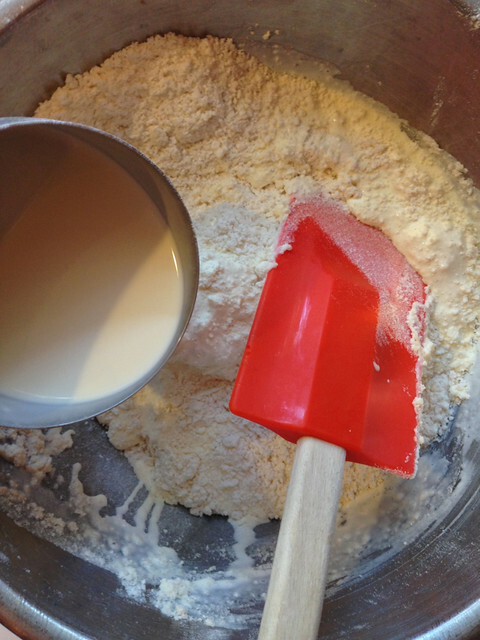 Add 1/3 flour mixture to batter, beating until just combined, followed by half the buttermilk, another 1/3 of the flour mixture, the remaining buttermilk and remaining flour mixture. Scrape down from time to time and don’t mix any more than you need to. In the bowl where you’d mixed your dry ingredients, toss the berries with the remaining 2 tablespoons of flour. 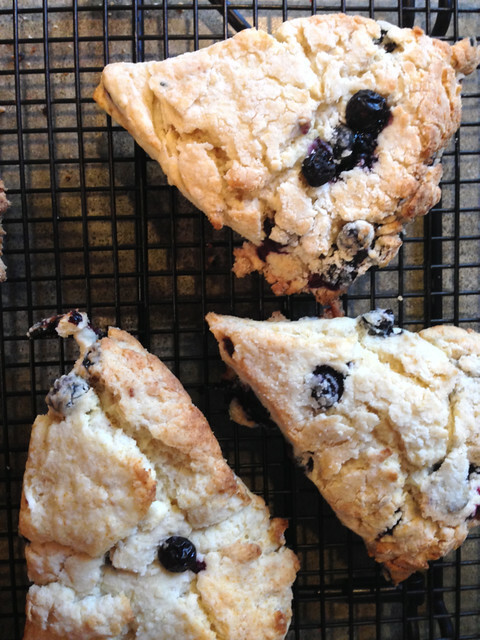 With a silicon spatula, gently fold the berries into the cake batter. The batter will be very thick and this will seem impossible without squishing the berries a little, but just do your best and remember that squished berries do indeed make for a pretty batter. Spread cake batter — you might find it easier to plop it in the pan in large spoonfuls, because it’s so thick — in the prepared baking pan and spread the top smooth. Bake for 55 to 60 minutes, rotating the cake 180 degrees after 30 (to make sure it browns evenly). The cake is done as soon as a tester comes out clean of batter. At 10 minutes before my baking time was up, a tester was totally wet with batter and I was certain it would never be done in the estimated time. 7 minutes later, the same tester was clean as a whistle, so fret not. Set cake pan on a wire rack to cool for 30 minutes, before inverting the cake onto a serving platter to cool the rest of the way. Cool completely. Once cool, whisk together the powdered sugar, lemon juice and butter until smooth and very, very thick. (If you’d like it thinner, add more juice, but I like the thick drippiness of it, seen above.) Spread carefully over top of cake, letting it trickle down the sides when and where it wishes. Serve at once or keep it covered at room temperature for 3 to 4 days. * Updated note, due to comments about cake sticking: If you have a nonstick Bundt, just a coat of butter or nonstick spray should do. However, if you have a regular Bundt, not nonstick coated, you’re really going to want to make sure every nook and cranny is well-coated with butter or even shortening (the solidity of both helps them stick to the cake walls), and then dust the inside with flour. Setting your cake pan in the fridge or freezer (to set the coating even further) while you make the cake batter will provide even more insurance. I hope this improves the release rate of the cake! Make a regular angel food cake mix according to package directions, but fold in one cup of fresh raspberries before pouring into tube pan. Serve with following raspberry sauce. Puree the raspberries in a blender or food processor. Add the confectioners; sugar, lemon juice, and amaretto, and continue to process until smooth. Strain the sauce to remove the seeds and serve.